With this sunny, 80-degree weather we have had in Fredericksburg this week, my roommates have been grilling many dinners outside. It being Pi Day, 3/14, I wanted to make pizza for dinner. 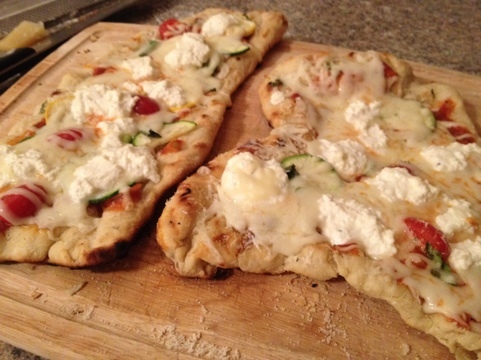 Combine both and it’s one of my favorite meals — grilled pizza! Topped with veggies and just a little bit of sauce and cheese, grilled pizza is truly delicious. I even stepped it up and made my own dough this afternoon at lunch — just 10 minutes to pull it all together. Cheaper than store bought too. I added spoonfuls of ricotta just because, why not? One important part if grilled pizzas is to not overload the toppings. Some of the best have just a tiny sauce and cheese, or garlic oil with cheese and basil. You get to use your creativity. 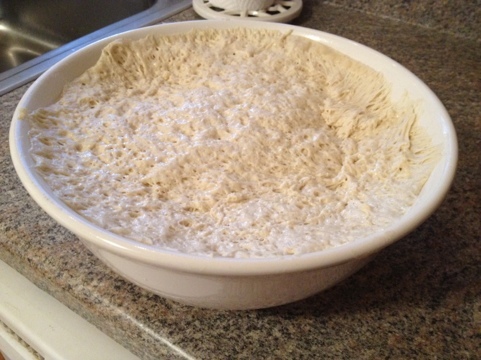 Start off with pizza dough, homemade or store bought. I have never tried Anything out of a tube though, so try to use fresh. Form into small pizzas. Just know they won’t be round. Unless you have pizza skills. Heat up your grill to a medium heat. Brush the pizzas with oil mixed with minced garlic. You don’t want them to stick! Cook mostly on one side. You want the dough to set up. Flip once, and cook just for a minute. That’s the side that will continue to cook again. Take the pizzas inside and add your toppings to the more cooked side. A little goes a long way! place back on the grill for a few minutes til cheese is melted and bottom crust is done.